Brick paver program lets Richland residents make their mark in Veteran's Park! RASA is pleased to announce a major facet of RASA’s commitment to build Veterans Park - the Commemorative Paver Program. Each paver is etched with your personal message or name. These pavers will create a unique walkway in Veterans Park. Don't be left out of this once-in-a-lifetime opportunity to help "pave" the way for our growing softball community to thrive - click here to download the RASA brick paver order form. Veteran's Park is a state-of-the art complex which boasts 4 lit playing fields, 2 all-purpose fields, a concession stand, a pavillion; as well as a tot lot, green space, and walking trails. RASA invites you to create a lasting memory to honor or remember your family, friends, or organization. The bricks are perfect to commemorate special occasions, such as a birth, anniversary or wedding; or to send a positive message. BUSINESS OWNERS! 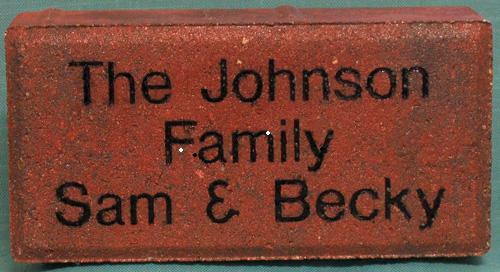 Purchase a brick engraved with your business name to show your support to our community! Become a Part of History Today! • Bricks will be ordered in lots of 100 and laid accordingly. Order early. Don’t forget to see if your company matches your donations, we are a certified 501 c organization. Leave a lasting impression today!